The Last Oracle is the second book in James Rollins’ Sigma Force series. After having read the first one and enjoyed it, I looked forward to this one. It begins with a prologue about the attack on the ancient Oracle of Delphi in 398 A.D. It was interesting, but I spent most of the book wondering what’s it’s significance to the main story was. When I did realize it, I thought it made for some interesting historical connections. The main story begins with a homeless man being shot on the Washington D.C. He then dies in Commander Gray Pierce’s arms after giving him an ancient Greek coin. This sets the Sigma Force on a search for answers as to who the dead man was. It leads them into a conspiracy that dates back decades and pits them against not only international forces but agencies within the U.S. that want to keep the conspiracy below the radar. The conspiracy also involves children with savant-like talents that have been enhanced with neurological implants. While Director Painter Crowe fights to save the life of one of those children in Washington, Grey and a team begin trying to unravel the trail behind the Greek coin. There is also a mysterious third party, a man without a memory and a group of children, who are also working to help Sigma Force unknown to both themselves and Sigma Force. 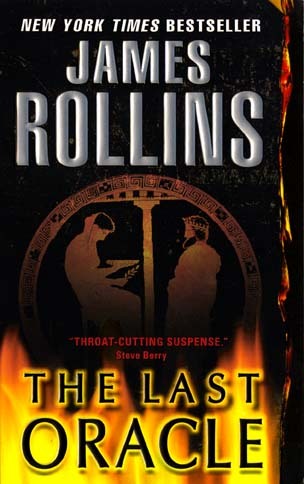 The Last Oracle is another historical mystery by Rollins that is full of thrills. It has some interesting surprises that I won’t spoil for you. You can also enjoy this book without having read the other books in the series. Sign up for my newsletter using the link above and you will get copies of Canawlers, October Mourning, and The Rain Man for FREE.